I tried NSURLSession but still receive the same error. Restarting the simulator fixed the issue for me. As far as we can tell, when iOS 8/9/10/11 receive an HTTP response with a Keep-Alive header, it keeps this connection to re-use later (as it should), but it keeps it for more than the timeout parameter of the Keep-Alive header (it seems to always keep the connection alive for 30 seconds.) Then when a second request is sent by the app less than 30 seconds later, it tries to re-use a connection that might have been dropped by the server (if more than the real Keep-Alive has elapsed). Increase the timeout parameter of the server above 30 seconds. It looks like iOS is always behaving as if the server will keep the connection open for 30 seconds regardless of the value provided in the Keep-Alive header. (This can be done for Apache by setting the KeepAliveTimeout option. The iOS 8.0 simulator runtime has a bug whereby if your network configuration changes while the simulated device is booted, higher level APIs (eg: CFNetwork) in the simulated runtime will think that it has lost network connectivity. Currently, the advised workaround is to simply reboot the simulated device when your network configuration changes. If you are impacted by this issue, please file additional duplicate radars at http://bugreport.apple.com to get it increased priority. If you see this issue without having changed network configurations, then that is not a known bug, and you should definitely file a radar, indicating that the issue is not the known network-configuration-changed bug. The same code works fine on iOS 7 and 7.1 simulators and my debugging proxy shows that the failure occurs before a connection is actually attempted (i.e. no requests logged). 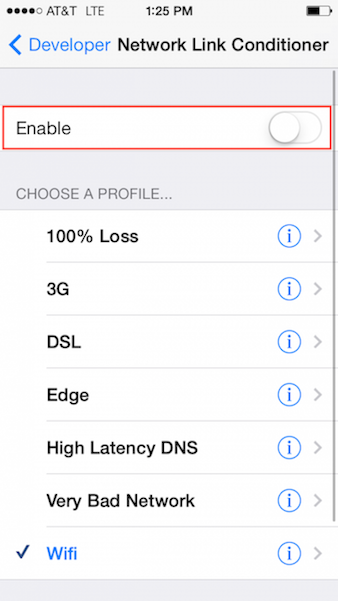 Changing to use https allows connection from iOS 8 simulators albeit with intermittent errors. Problem is still present in Xcode 6.01 (gm). what solved the problem for me was to restart simulator ,and reset content and settings. I was experiencing this problem while using Alamofire. My mistake was that I was sending an empty dictionary [:] for the parameters on a GET request, rather than sending nil parameters. See pjebs comment on Jan 5 on Github. dispatch_group_wait(downloadGroup, dispatch_time(DISPATCH_TIME_NOW, 5000000000)); // Wait 5 seconds before trying again. [self redoRequest]; //Redo the function that made the Request. Solution: Use a method to do connection to the site, return (id), if the network connection was lost, return to use the same method. I was getting this error as well, but on actual devices rather than the simulator. We noticed the error when accessing our heroku backend on HTTPS (gunicorn server), and doing POSTS with large bodys (anything over 64Kb). We use HTTP Basic Auth for authentication, and noticed the error was resolved by NOT using the didReceiveChallenge: delegate method on NSURLSession, but rather baking in the Authentication into the original request header via adding Authentiation: Basic <Base64Encoded UserName:Password>. This prevents the necessary 401 to trigger the didReceiveChallenge: delegate message, and the subsequent network connection lost. I had same problem. Solution was simple, I've set HTTPBody, but haven't set HTTPMethod to POST. After fixing this, everything was fine. I had the same problem. I don't know how AFNetworking implements https request, but the reason for me is the NSURLSession's cache problem. After my application tracking back from safari and then post a http request, "http load failed 1005" error will appear. If I stop using "[NSURLSession sharedSession]", but to use a configurable NSURLSession instance to call "dataTaskWithRequest:" method as follow, the problem is solved. Just remember to set config.URLCache = nil;. I had to exit XCode, delete DerivedData folder contents (~/Library/Developer/Xcode/DerivedData or /Library/Developer/Xcode/DerivedData) and exit simulator to make this work. I have this issue also, running on an iOS 8 device. It is detailed some more here and seems to be a case of iOS trying to use connections that have already timed out. My issue isn't the same as the Keep-Alive problem explained in that link, however it seems to be the same end result. I have corrected my problem by running a recursive block whenever I receive an error -1005 and this makes the connection eventually get through even though sometimes the recursion can loop for 100+ times before the connection works, however it only adds a mere second onto run times and I bet that is just the time it takes the debugger to print the NSLog's for me. You'll see that I use a AFHTTPRequestOperation subclass but add your own request code. The important part is calling recurse(@offset.intValue+1)); to make the block be called again. If anyone is getting this error while uploading files to a backend server, make sure the receiving server has a maximum content size that is allowable for your media. In my case, NGINX required a higher client_max_body_size. NGINX would reject the request before the uploading was done so no error code came back. I was getting the error on an iOS 7 device when I was using Xcode 6.2 beta. Switching back from Xcode 6.2 beta to 6.1.1 fixed the issue, at least on an iOS 7 device. If the problem is occurring on a device, check if traffic is going through a proxy (Settings > Wi-Fi > (info) > HTTP Proxy). I had my device setup to use with Charles, but forgot about the proxy. Seems that without Charles actually running this error occurs. I was connecting via a VPN. Disabling the VPN solved the problem. I was hitting this error when passing an NSURLRequest to an NSURLSession without setting the request's HTTPMethod. Error Domain=NSURLErrorDomain Code=-1005 "The network connection was lost." Test if you can request from other apps (like safari). If not might be something on your computer. In my case I had this problem with Avast Antivirus, which was blocking my simulators request (don't ask me why). Restarting the computer fixed the issue for me with Xcode9.1. I had restarted the simulator and Xcode, it doesn't work. A: NSURLErrorNetworkConnectionLost is error -1005 in the NSURLErrorDomain error domain, and is displayed to users as “The network connection was lost”. This error means that the underlying TCP connection that’s carrying the HTTP request disconnected while the HTTP request was in progress (see below for more information about this). In some circumstances NSURLSession may retry such requests automatically (specifically, if the request is idempotent) but in other circumstances that’s not allowed by the HTTP standards. I was having this issue for the following reason. TLDR: Check if you are sending a GET request that should be sending the parameters on the url instead of on the NSURLRequest's HTTBody property. I had mounted a network abstraction on my app, and it was working pretty well for all my requests. I added a new request to another web service (not my own) and it started throwing me this error. I went to a playground and started from the ground up building a barebones request, and it worked. So I started moving closer to my abstraction until I found the cause. My abstraction implementation had a bug: I was sending a request that was supposed to send parameters encoded in the url and I was also filling the NSURLRequest's HTTBody property with the query parameters as well. As soon as I removed the HTTPBody it worked. I was receiving this error and also notices that the application Postman was also falling but was working in app Advanced Rest Client (ARC) and working in Android. So i had to install Charles to debug the communication and I notices that response code was -1. The problem was that REST programmer forgot to return response code 200. I hope that this help other developers. I was facing the same issue, I have enabled Network Link Conditioner for slow network testing for the app. That was creating this error some times, When i have disabled it from Settings > Developer > Network Link Conditioner, it solved my problem. I faced the same issue while calling using my company's server from iOS 12 app with a physical device. The problem was that the server hard disk was full. Freeing space in the server solved the problem. Whenever got error -1005 then need to call API Again. You need to Add your code to call function again. MakeSure that you were call method once otherwise its call recursive loop. It is saying that there is a bug in the iOS 12. Basically you cannot expect a network call to ever complete if the app os not in foreground. And due to this bug the network calls get dropped and we get network fails in logs. My best suggestion to you is provide some delay when your app are coming from background to foreground and there is network call. Make that network call in the dispatch async with some delay. You'll never get network call drop or connection loss. Not the answer you're looking for? Browse other questions tagged ios8 ios-simulator xcode6 xcode6-beta5 or ask your own question. Why NSURLConnection failed with Error Domain=NSURLErrorDomain Code=-1005 “The network connection was lost.” in Swift iOS8?